3rd Generation with Built-in Motion Sensor: Distinguished from most solar spotlight on the market with great PIR sensor which detects people up to 23 feet within 120 degrees. The spotlight is light sensitive and won't light up in bright place. Bigger Solar Panel with Shorter Charging time: 6.7*3.6*1.6 inches large solar panel absorb sunlight more efficiently. 180 Degree Adjustable Angle: Both panel and lights are fully adjustable to get optimum sun exposure and illuminate perfect spot. 4 Working Modes: Dim Light, Full Brightness Light, Dim Light + Motion Sensor Full Brightness Light, Off + Motion Sensor Full Brightness Light. 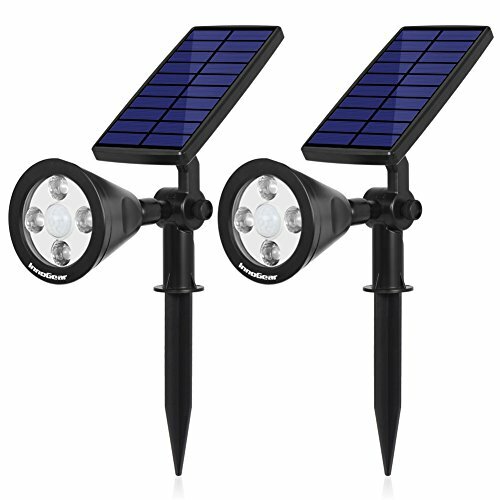 Multifunction In-Ground Solar Light and Wall Light: Stick into the ground / Use included screws to mount on the wall.